Will long haul aviation be possible after peak oil? My mo st recent long haul flight was from London Heathrow to Melbourne. I must admit that with the excitement of the trip, sustainability wasn’t at the forefront of my thoughts as I settled into a business class seat. With a flying time approaching 24 hours, it had been a conscious effort to upgrade to the pointy end. Thankfully with a combination of frequent-flier points and not thinking about the impact on my bank balance that had been possible. However, as we increased speed for take off, the size, weight and power of the plane came into focus as the engine roar became suddenly much louder. I do remember thinking briefly what power the engines must be generating. 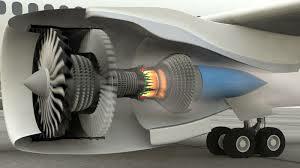 Of course modern aircraft fuel is highly refined and a relatively efficient fuel. However, you need plenty of it to get modern passenger jets off the ground. The Airbus A380 is the largest of the beasts with a fuel capacity of over 350,000 litres. It costs around £111,000 to fuel one of these monsters at today’s price (August 2015). With a return flight scheduled for next June, that fact alone helps me understand (to some extent at least) the price of the tickets. Given the weight of the aircraft, the passengers, luggage and freight load, distances travelled and available fuel storage, it seems unlikely that there are any meaningful alternatives to jet propulsion. Whilst both electric and solar powered flight is possible, this is largely a theoretical and academic challenge which is unlikely to move into mass transportation any time soon. However, in a time when oil reserves are being used up at an increasing rate, how will flight be possible without access to the fuel to power these incredibly powerful but thirsty engines. For some years, researchers have been predicting the gradual decline of air travel brought on by diminishing oil reserves. Of course, people have been predicting peak oil (the point at which maximum production has been reached and supplies begin to diminish) for many years. We still produce billions of gallons per year and the idea of peak oil remains controversial. However, most commentators agree supply is likely to become more difficult after 2050. If this is correct and given existing demands on oil for road transport, heating, manufacturing and a thousand other high profile things, it’s hard to see civil aviation competing for increasingly scarce resources. This could make flight the domain of the super rich and simply price people out of the market. What is clear is the status quo is unsustainable based on current fuels. So, given the requirement to find a fuel which could be used in existing (or slightly modified) engines and have similar weight to power profiles are there any options? A non dissimilar situation may give us some pointers for the future. 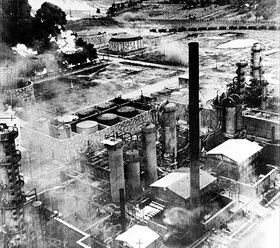 Technology in the 1940’s was certainly embryonic in comparison to synthetic fuel manufacture technology today. This shows that even during the most adverse conditions, synthetic fuel production could provide one mechanism to create the high octane chemicals required by the aviation industry. Other possibilities include the rise in the production of bio fuels. Boing and Airbus have research projects into the replacement of current fuels with bio production. The early results seem to show considerable cost implications for jet propulsion but real possibilities for shorter range turbo-prop aircraft. Alternatively, this could be blended with traditional fuels to ‘stretch’ kerosene as far as is possible. If bio-fuels are the answer then we better get used to more, shorter low speed trips. My flight to Australia would still be possible but I may find it made up of several shorter legs. One of the more surprising candidates is being developed separately by General Electrics and LEI. Using a combination of superconductors, the strength and lightness of graphene and lighter aircraft design electric jet propulsion may be viable in the very near future. 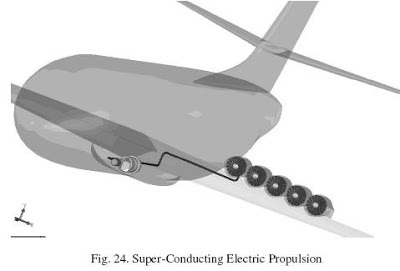 LEI has already successfully demonstrated a superconductor electric engine suitable for a Cessna light aircraft. Although this was only intended to be a proof of concept the results were enough to convince even the most hardened cynic. On a larger scale, jet airliners designed to carry 120 passengers powered by electric jet engines are well into the test production stages. In this example, each wing has the usual single engine replaced with five smaller electric engines. As technologists have faced the inevitability of changing from aviation fuel the advantages of the alternatives also start to emerge. This aircraft would be significantly quieter and the engines could be powered by a variety of far more sustainable sources. Longer term, there is a strong candidate in liquid hydrogen. German and Dutch airlines are already powering their groundcrew vehicles with this fuel and both NASA and Boeing have plans to increase research in this area more than any other comparable technology. All the major manufacturers have plans to refit their existing fleet and design new craft based around liquid hydrogen fuel. Although it requires greater capacity in terms of volume compared to traditional fuel it is significantly lighter. 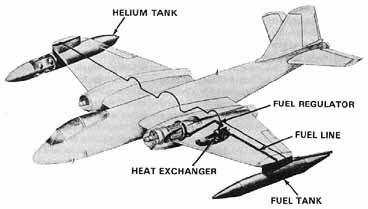 For anything over mid range flights the fuel cost would be reduced over current fuels. Two German and one Dutch airline are working closely with manufacturers to see the first hydrogen powered planes in our skies by 2040. One particularly canny chemist has worked out how to produce hydrogen as a by-product of bio-fuel production. Apart from the potential cost and weight advantages of hydrogen, the big advantage is that the pollution produced by the engines is non-existent. Just water vapour. With the degree of innovation in this area, I’m confident that my trips to Melbourne are secure. We have too much of a love affair with long haul flight to return to a period without this freedom. The most recent investors in the hydrogen fuel process are interestingly nothing to do with aviation but are the traditional car manufacturers wishing to learn from this experience. With peak oil approaching (as it has been for many years) we may very well be at the end of the fossil fuel era and the dawning of the age of Hydrogen. This is a very well thought out and elaborate post! Great job! My background is in mechanical engineering and my senior design project involved an lng powered aircraft which we successfully built and flew. Transition to a different fuel shouldn’t be difficult, the problem lies in the fuel storage capacity. With fuels like hydrogen and natural gas, you have to go cryogenic to hold sufficient fuel due to the fuels density. I think electric is the ultimate goal with increased battery storage capabilities. One example that comes to mind is the solar impulse. I enjoyed your post and gave you a follow 🙂 look forward to more awesome posts! !